Today in Italy there is a new favorable tax regime for those who support culture with charitable donations. It's called Art bonus, and it is a tax credit equal to 65 % of charitable contributions that individuals or companies make in favor of public cultural heritage. The Art bonus is revolutionary for our country, which has a unique cultural heritage. Now every citizen can contribute to protecting Italy’s cultural heritage, and passing it on to the next generations with this simple gesture. With a donation, you receive not only a tax advantage but also the pride in taking care of the Italian cultural heritage. - realisation, restoration and upgrading of facilities of public institutions dedicated to performances. If you have already identified a cultural work to which you would like to contribute, please contact the owner or ALES to agree upon the details of money transfer (through a bank, post office, debit or credit and debit cards, bank checks), and save the receipt of the Art bonus transaction to take advantage of the tax benefits. If you have not yet chosen the cultural work which you would like to support with your contribution, please review the list of projects already published on the website www.artbonus.gov.it (where you can also submit suggestions on other works not included) or review the website of public institutions/cultural organizations within your region or city, and choose what cultural works you could support. Are you a beneficiary of donations? Register on www.artbonus.gov.it and "put on display" your cultural work to support. Publish on the website www.artbonus.gov.it and on your corporate website, the amount of donations that you have received and how you are spending it. 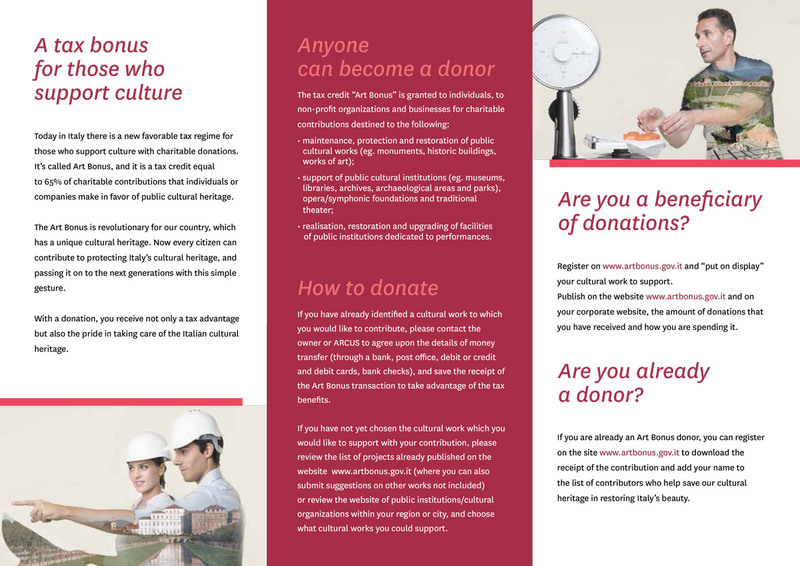 If you are already an Art bonus donor, you can register on the site www.artbonus.gov.it to download the receipt of the contribution and add your name to the list of contributors who help save our cultural heritage in restoring Italy’s beauty. by the beauty of art. Each letter composing the Art Bonus logo comes from the original signature of some of the great masters of Italian art. The logo has been conceived and created by a young graphic designer, Gianluca Spinella, who donated it as a pure act of liberality. Thus, the logo embodies the spirit of patronage which inspires this revolutionary initiative for the Italian culture. The Art Bonus logo features letters from the signatures of Carrà, Canaletto, De Chirico, Leonardo, Michelangelo, Raffaello, Tintoretto and Tiepolo.